I'm glad I'm not alone on this one. It's fantastic to get books translated from their original language to English so we can learn more about other countries, and I was hoping that this one would have some good details about daily life and the Chinese landscape, like Zhang's The Emperor's Riddle. Instead, it's a rather standard fantasy about tomb robbers with rather unsympathetic characters. I loved this brilliant comment by Josie: "If I'm so bored with a novel that I start hoping the main character will be brutally maimed to liven things up a bit, that's your brilliant indication that I'm not enthusiastic about what I'm reading." I'm going to hand this to one of my readers who goes through 2-3 fantasy books a day, so as an 8th grader really has read just about all of my fantasy books, but I'm not going to put it in the collection. An inordinately large portion of the books that look brand new but have never circulated are fantasy books that are just half a bubble off. I'll see what the 8th grader thinks. While I appreciate the effort required to translate a book from Mandarin to English, City of Sand wasn't worth it. I think all the explanation required is this: if I'm enjoying a book, I usually care about the protagonist. If I'm so bored with a novel that I start hoping the main character will be brutally maimed to liven things up a bit, that's your brilliant indication that I'm not enthusiastic about what I'm reading. 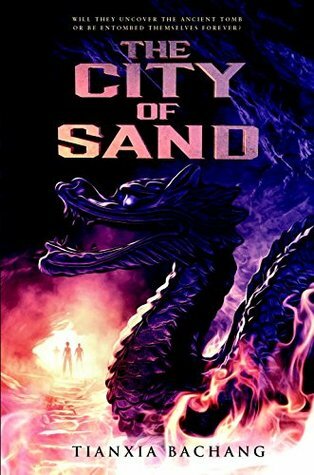 City of Sand was what I would now call an Indiana Jones wannabe. And while Indiana Jones is a fantastic set of movies, that's the implication of the word wannabe; you tried, and you failed. Boring. The City of Sand has an interesting adventure wrapped up in a quest - a desert journey to seek out an ancient city with a queen of mythic proportions. Unfortunately, the delivery of the story was a snooze-fest. Look, I don't know if things literally got lost in translation or whether the form of the story is different than what you would expect in a typical YA lit book, it is super dry to read. It is fully fast-paced, but is so descriptive in it, it feels like an AI is reading out an epic adventure. (I honestly cringe to think about an audiobook like that *shudder* Think Text-to-Speech in Kindle)Until right at the end, I was hovering at a 3-star rating. The pacing was dreadful but the world-building and the adventure was good enough to somewhat balance it. But then it ends in a very weird way, with barely any conclusion, and a random scene about drinking a lot of water (supposedly to show the end of the journey?) and I was like - I did not go through all this, bear with that awful writing for this! Like, even the chapter endings were weird - they were less of a cliffhanger and more like someone just randomly hit pause while you were streaming a movie. So I don't think it is entirely just an issue of bad translation, because the bare bones of this book seem unstable. The characters have no development, their relationships with each other is described only through the eyes of the protagonist but it is all tell, no show. Suddenly mid-way through the book, it is revealed that two characters have hated each other all along (for no discernible reason) *looks around confused* and then they are bickering till the end. The dialogues - well, I am chalking that up to translation, because it just comes off as stilted and awkwardly misplaced. I am not even going to comment on the loose threads in this story because if there is a sequel, I am so not reading it. The bottomline is that, despite what could have been an engaging story, this book was not enjoyable mostly because of the writing. Received an advance reader copy in exchange for a fair review from Random House Children's, via Netgalley. Tianyi is an unusual girl who doesn’t want to do anything that other “good” girls do. Unknown to her family, her grandfather left her half a book about what westerners would call “grave robbing.” Then she studies the art of feng shui meant to guide her to correct tombs that will provide blessings in wealth rather than curses all too possible in other gravesites. In China, after all, there are ghosts, snakes, and other nefarious creatures that could kill quickly, neatly and without anyone else knowing. From the beginning, Tianyi and her friend, Kai, work well together. Kai may not have the academic skills Tianyi has from her grandfather’s book but he is an adventurer and can be trusted with any sharing. Their first encounters with ghosts and/or reanimated corpses is hair-raising but fun that readers will love. After a while, they realize they need to travel with others of like mind and even better skills. They thereafter join the archeological expedition of a Professor Chen and the American who is financing the project, as well the Professor’s entourage, to find Jingjue City, one spot on the Silk Road sacred tombs may be found with accompanying cultural artifacts.No spoilers here! Suffice to say that numerous adventures follow with some truth, some lies, and some betrayals pitching the action forward. In some ways, the action goes nowhere, with little of importance discovered at first, and this may frustrate some readers. But for the most part, the this is a Young Adult novel for those who love to read about myths, legends, adventures and foreign locales. A bit of a vague ramble about life in a different world few of us could imagine yet get the chance to enter in these contemporary legendary pages! It was a very good book considering the ancient chinese art of following the stars and solving puzzles to find a lost city just to run into a lot more trouble than they had wanted.